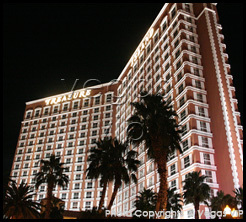 Address: 3300 S. Las Vegas Blvd. Restaurants : Francesco's, Pho, The Steak House, Isla Mexican Kitchen & Tequila Bar, Social House, Kahunaville, The Buffet at TI, Canter's Deli, Ben & Jerry's and Sweet Temptations. 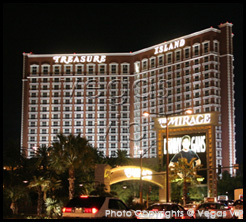 Treasure Island, the Las Vegas hotel formerly known as Treasure Island, has evolved over the years into a beautiful, luxurious and entertaining resort. Designed to instill the feeling of an elegant Caribbean hideaway, Treasure Island offers lush accommodations, nightlife, entertainment and gaming all in one. Aside from the infamous pirate show, The Sirens of Treasure Island, which happens in front of the hotel in the Pirate's Cove, Cirque du Soleil's Mystere also shows here. It is a kaleidoscope of athleticism, high-energy acrobatics and imagery. Created by Las Vegas legend Franco Dragone, Mystere serves as a consistent invocation of awe and amusement. Treasure Island boasts a 90,000 sq. 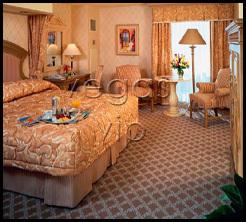 ft. casino, decorated in rich gold and whitewashed tones with black accents. Offering a complete variety of gaming pleasures including table games, slot machines and video poker. There is also a Race and Sports Book. For dining, guests can try the new Social House, located atop Tangerine Nightclub, Isla Mexican Kitchen, Canter's Deli, Francesco's and the The Steak House among others. Dishes, the buffet at Treasure Island, offers six live-action exhibition stations including barbeque, Asian, pasta saut・ a rustic pizza oven, salad station and bakery. On Friday and Saturday nights, experience 'swanky dishes,' offering a selection of upgraded entr馥 items. TI offers some of the hottest nightspots available in Las Vegas. For starters, Tangerine at TI brings a new chic vibe to the Strip with a seductive staff of beautiful bartenders and burlesque dancers. Tangerine features an indoor lounge and outdoor deck, plus a DJ spinning rock and dance. In addition to Tangerine, Mist boasts the intimate feel of a neighborhood bar and is known as the perfect place to sit back and relax in a stylish, yet casual setting. Visitors to the resort may also lounge at the Breeze Bar or Margarita Bar.